A unique 'Folk Treble' event showcasing original material from three distinctly different acts - Every Thread, Under The Wychwood and Mike Weaver - is set for Evesham on Thursday 18th April. Cotswolds-based Under the Wychwood are a young up and coming band with the average age of about 55½, who play an eclectic mix of Folk, Americana and Acoustic Blues. Mark Pidgeon (guitar and vocals), Rod Craig (mandolin) and Mat Davies (bass), all come together when there’s a full moon and do strange things in and around the woods of West Oxfordshire. Mostly musical, although it has been said they sometimes sit around drinking tea! A typical set list includes self-penned numbers, cover versions of well-loved standards and contemporary items - making the band hugely popular at folk clubs and festivals throughout the area. Every Thread (Zoe Titchener and Mike Weston) are an acoustic duo from Birmingham who, in the words of Left For Dead Records, "weave gorgeous melodies into lovely little nuggets of folky pop." They create a stripped-back, intimate sound with guitar, bass and female vocals. Comparisons have been drawn to Everything But The Girl, Belle & Sebastian and Curved Air - with everything from folksy vibes to upbeat melodies, their set is always varied and engaging. Mike Weaver - who has lived in Worcestershire for twelve years - is known for his self-penned songs which "exude beautiful harmonies, clear story telling and a passion for people." He returned to writing and performing in 2013, and since then has released three CDs, songs from which have received airplay on folk radio stations all over the globe. The artists - all of whom make a welcome return to Evesham - are teaming up to present their work in the lovely 17th century Oat Street Chapel on Thursday 18th April. The concert will start at 8.00pm, with doors open at 7.30pm. Tickets are £9 in advance, now available online from www.wegottickets.com/event/463723 , or £10 on the door. Door tickets subject to availability. Public car park adjacent (free after 6pm). Please note there is no bar at the chapel but audience members are welcome to bring their own drinks. 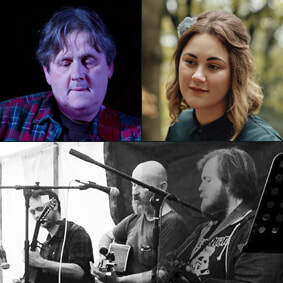 An evening of original, contemporary and traditional music from FATEA-nominated Kim Lowings, folk and roots trio Town Musicians of Bremen and singer-songwriter Mike Weaver. With The Greenwood, Kim Lowings has firmly rooted herself into the British folk scene. Their sound is “punchy and authentic” (Mike Harding) and cleverly combines original songs with familiar traditional tales highlighting the continued relevance of tradition today. Kim will be solo at this event. Town Musicians of Bremen are Andrew Lowings (Bouzouki, and Kim's father!) Leon Gormley (Guitar & Cittern) and Lewis Jones (Nyckelharpa & Melodeon). They play with soul, humour and dexterity, producing sounds which are equally traditional and contemporary, and immensely enjoyable. Mike Weaver is a singer-songwriter from Worcestershire who is known for his self-penned songs which "exude beautiful harmonies, clear story telling and a passion for people." Previous 'Folk Trebles' have featured Mike with Midlands-based duo Ashland (David Sutherland & Kathryn Marsh), Russian singer and songwriter Daria Kulesh, award-winning Kim Lowings, Evesham's very own Colin Pitts and the hugely entertaining contemporary/traditional folk trio Town Musicians of Bremen (Leon Gormley, Lewis Jones & Andrew Lowings). 'Folk Treble' events take place in historic buildings - venues in Evesham, Tewkesbury and Worcester have all been involved (see below). More events are planned in future - and can even come to you. We have our own PA system (sutiable for small venues, village halls, chapels etc) - and folkie artists like us are always looking for interesting places to play. For details, please get in touch via the contact page on this website.